Samantha and Savanna are taking their love for Yoga and the great outdoors to Samara, Costa Rica in winter 2019 and they are inviting you to join them! Samara is a paradise of palm trees, sapphire waters and exotic wildlife. We will hike through the tropical jungle to waterfalls, stroll along sandy beaches and practice yoga to the sound of the morning bird songs. In addition, you will have opportunities to build friendships, indulge in delicious food, and experience a new culture. fresh local meals (breakfast and dinner daily; lunch is up to you. Samara has many great restaurants and each villa has a private kitchen where you can prepare meals). Any activities or meals not described in the itinerary. This adventurous escape offers a chance to explore the practice of Yoga in a new place and engage in self-exploration. 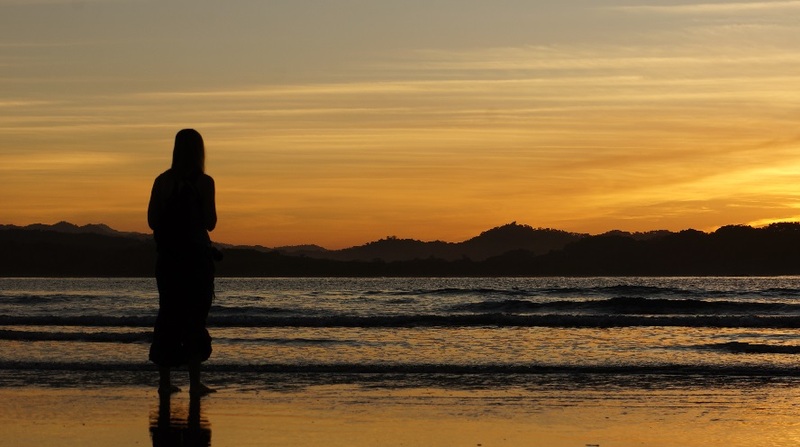 We invite you to relax, unwind, try something new and come PLAY with us in the coastal city of Samara, Costa Rica. To reserve your space for this incredible experience you can register with a non-refundable deposit of $500. This payment of $500 will go toward your total ticket price of $1,400. Your remaining balance of $900 is due 30 days before the retreat begins. Shared accommodation at Villas Espavel private resort is included in your ticket price. Villas Espavel Resort is comprised of five small villas surrounding a sparkling blue swimming pool. Each villa has a unique personality and amenities. Your ticket reserves your private queen bed. We are happy to make arrangements for guests that would like to book with a partner or friend. Please let us know any roommate requests you have at time of booking. *Private accommodations are available for an additional charge on a first come, first serve basis. Please contact adventuretriberetreats@gmail.com to request more information. ATR is delighted to offer retreat participants a light breakfast and a hearty dinner during your stay in Samara. Lunch is not included in your ticket. We want you to have time to explore Samara, relax in the hammock, or skip out for surf lessons in the middle of the day. There are several restaurants in town and each villa has a kitchen or kitchenette to prepare personal meals. Savanna is an ATR co-founder and experienced yoga teacher. She brings playfulness and relaxation to her classes by encouraging participants to explore their personal experience. Each day participants will have the chance to practice yoga to the rising or setting sun. Samantha has spent the past two winters exploring Samara with her family and is ready to share her local insights with the Adventure Tribe. She will lead participants on a moderate hike to a private beach up the coast of Samara. In addition, Samantha’s friend and Samara resident, Manny will lead all of us on a rugged hike through the jungle to a pristine waterfall destination. The jungle hike requires a moderate level of fitness and is a full-day activity. It is common to see monkeys, sea turtles, exotic birds, and many other native wildlife during our hikes through Samara. Included in your ticket are daily group workshops focused on the core values of Adventure Tribe Retreats: yoga, adventure, plant-based food, and good vibes. We hope all participants have a chance to learn something, share something, play and stretch the boundaries of their comfort zone, this is an ADVENTURE after all! **Accommodation, classes, hikes and workshops included in ticket price. I represent and warrant that I am in good physical health and do not suffer from any medical condition which would limit my participation in the activities offered by Adventure Tribe Retreats. I understand that it is my responsibility to consult with a physician prior to and regarding my participation in any of the activities, including, but not limited to: yoga classes, hikes, programs, or workshops. I understand the risks associated with the activities offered by Adventure Tribe Retreats and I agree to follow all instructions so that I may safely participate in classes, hikes, workshops, or other activities. I hereby WAIVE AND RELEASE Adventure Tribe Retreats, LLC, its owners, officers, employees, and instructors from any claim, demand, cause of action of any kind resulting from or related to my participation in the programs offered at the facility. In taking part in the yoga classes, workshops, or other activities with Adventure Tribe Retreats , I understand and acknowledge that I am fully responsible for any and all risks, injuries, or damages, known or unknown, which might occur as a result of my participation in the classes, workshops, or other activities. I authorize the photographs taken during event that may be used for promotional purposes by Adventure Tribe Retreats. I have read the above release and waiver of liability and fully understand its content. I am legally competent and voluntarily agree to the terms and conditions stated above.